South Park has had its share of dodgy games, including that rubbish one with snowballs as weapons on Nintendo 64 - c'mon, you know it sucked, admit it - though some reckon The Stick of Truth is a decent effort; not that Nintendo gamers had a chance to play that one. It seems, though, that a particularly ambitious project bit the dust in a past generation. Nintendo Life chum and occasional contributor Liam Robertson has teamed up with Did You Know Gaming? to share details on an open world game that was planned for PS2, Xbox and GameCube. Ubisoft was to be the publisher, of course, but had actually tasked the little-known Buzz Monkey Software to work on the project. The young studio spent ten months working on an ambitious title that would create the show's world in intricate detail, and included GTA-esque features such as jumping into cars to explore the world. Circumstances worked against it and it was canned, though the studio went on to produce high-profile ports before being acquired by Zynga in 2012. You can learn all about it below. I watched HappyConsoleGamer's video about this game when he uploaded it and was fast enough to see this video before NL posted an article about it. 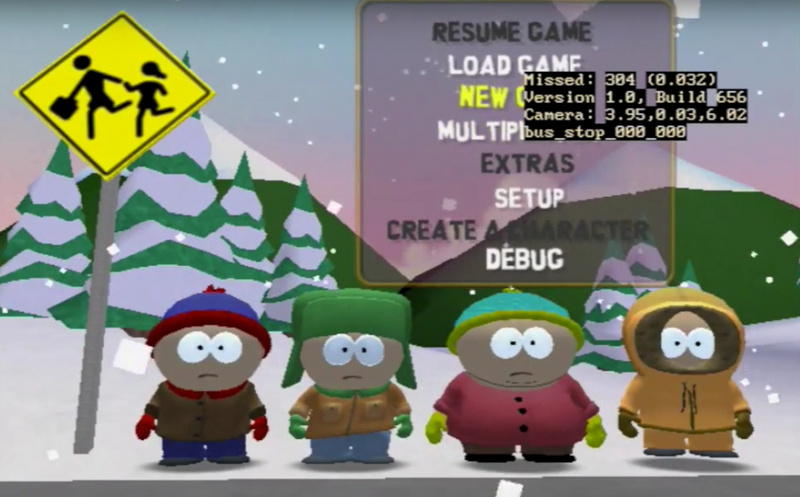 Not really into South Park but it's always nice to get a peek at a game that never came to be. Stick of Truth is far more than a decent effort, It's really great. I've been playing it slowly because I don't want it to end. Stick of Truth was one of my favorite 'surprise' games that I didn't expect to be nearly as good as they were, and I had nostalgia for the N64 South Park game because me and my best friend at the time were immature kids who loved the show enough to spend hours throwing farting Terrence and Phillip dolls at each other in multiplayer. That being said, this game looked like it was shaping up nicely, and I would have wanted it on my GameCube to go along with Simpsons: Hit and Run, which is still a lot of fun to pop in once in awhile. GTA is fine, but it's nice to see something that doesn't take itself too seriously and emulates cartoons I still like to watch. I'm very impressed with the physics of South Park, and it's a shame that it was canned because one guy was being a jerk. I am watching episodes of South Park I have not seen, and let's just say I am in a South Park mood. I wish this game came through. Stick Of Truth is not a 'decent effort'. Its a masterpiece. Show some respect. Stick of Truth was an awesome game. Can't wait for the fractured but whole c: Shame this game got canned, it probably would've been a lot of fun and sold well. I'm rather curious as to how that South Park game would have rather turned out to be. And I personally agree with Nintendo Life that Stick of Truth is a decent game (Yes, I own an Xbox 360 and played it on there). Johnny Millennium from six weeks ago says "Hai". Oh My God, They Killed Kenny's Game! Those Bastards! @the_shpydar The game was discovered over 14 months ago, HCG wasn't first. Either way, the video I captured was done properly in 480p instead of 480i, which makes a huge difference. And if you check out my channel for the full video, youll see much more of it. @antipop621 This. Stick of Truth is amazing, and this article makes it sound like it's bad but some people like it anyway. Couldn't be further from the truth, the game was well received by gamers and critics alike. Shame on whoever wrote this article. The article writer is taking a decent ribbing! It's always a shame when people insert their own opinion in non-review articles. I do not watch South Park but even I do like Stick of Truth. The number of side quests in that game is abound. Gotta add my voice to people defending The Stick of Truth, it's really good. And N64's South Park game despite not being amazing wasn't bad at all, had a lot of fun with it, and the multiplayer was far from terrible. Stick of Truth was far better than "decent" it's a game that truly felt like it could have easily been a movie or multipart TV episode and captured the world of South Park perfectly. Not to mention it was mentioned quite a bit for GOTY. Stick of Truth is currently placed #3 of most/best user rated games in Xbox One's marketplace. GTA V was #1 for whole year before Fallout 4, Rise of Tomb Raider and Stick of Truth (backward compatible Xbox 360 game) dropped it to #4 under week after release. Turns your Game Boy into an arcade machine! Kinda! Why wait for Nintendo to release the Game Boy Classic Edition?